With the return of Windows to my life, new gaming opportunities have arisen again. Combine this with the annual Steam sale and having a few dollars to burn, it was time to try a game that my buddy had been pestering me about for ages. Darkest Dungeon. When I first saw this game, it was still very beta but on my buddy’s awesome and giant plasma TV. As a fan of the grim-dark, it immediately grabbed me with its unique art style, and the retro feel of the side-scrolling battles reminded me nicely of the Tales of Phantasia series from Namco. The dark nature of the game was extremely appealing too, with its Lovecraftian overtones and the need for your heroes to rest and recuperate between adventures in a meaningful way. This game is available on Steam for Apple, Windows, and soon Linux systems. OSX and Windows computers, with a Linux version in the end stages of development as of this writing. I played it using a computer running Win7 with a middle of the road graphics card. To be clear here, these are not mindblowing 3D renders. The entire game is 2D, and heavily stylized. The “Good” rating here is because the game is consistent and clean looking, with a well defined aesthetic that they stick to like glue. All of that combined with a clear and well executed artistic design make it very enjoyable to watch while playing. Gaemplay is fun, but can get a bit repetitive. The game is also blunt with you that you will lose party members, and that you will fail missions. It is all true. There are a few quirks, like not being able to retain purchased equipment between missions, that drop this from what would have otherwise been an “Excellent” rating though. This game features tight gameplay using tried and true methods to allow you to navigate and battle. There is very little creativity here, but the game benefits from from a reliable and solid system. 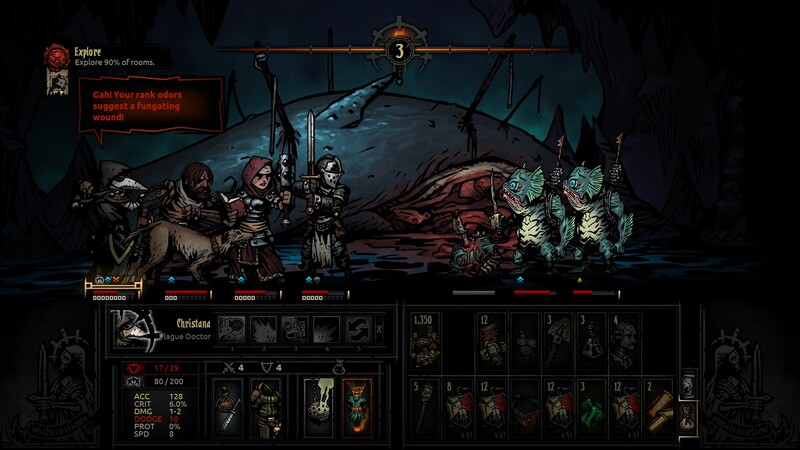 Darkest Dungeons will run you $24.99 USD ($27.99 CDN) on Steam without a sale one. It’s not a heavy price, but it is a bit high for what you get. For an extra $5, you can get the soundtrack as well, but I didn’t opt for this. This actually surprised the hell out of me. Not only are several of the iconic images of characters POC, but the character creation is randomized, meaning that any character with exposed skin can be generated as a POC. This was very cool. They also kept racism/stereotypes more or less under wraps, with only one character (the Occultist) showing a design bias (Orientalism). This game also gets points for a diversity of sexes, with male and female characters being available (albeit randomly). This game has been likened to the original Rogue, and not without reason. You navigate the environments using a simple grid system, with each square representing a hallway or event area. Once you select the square you wish to enter, it swtiches to a side-scrolling walk’n’fight affair against enemies who are similarly in a row. Tactical thinking is important, as different characters have different strengths and weaknesses, and different preferred spots in the marching order. All of this also plays into the mental fatigue aspect of the game, as characters out of position and in discomfort will break sooner than they should. As you battle your way through the game, the soundtrack and art style very rapidly meld with the gameplay elements and form a great experience. A stressful one though, since you are seldom fully prepared for what you will be facing, and the game will make good on its promise that you will fail missions and lose heroes. I have yet to finish the game, because, in all honesty, it’s very engrossing and I need to remember to do things that aren’t trekking through hallways, praying to survive while madness and hunger take their toll. Overall, Darkest Dungeons is a much needed breath of dank, fetid air in a world of brightly coloured battles, and sloppily designed “noir” and “dark” games. It’s a fun go, and at a okay price point, worth picking up. All images used are from Steam and the Darkest Dungeons website, used here for review purposes within fair use.